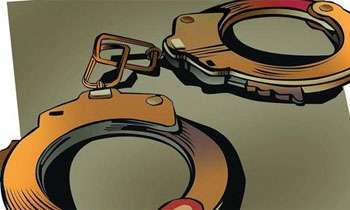 An Air Force deserter, Dileepa Kumaratunga alias Samantha was arrested by the Colombo Crimes Division (CCD) at the Bandaranaike International Airport (BIA) yesterday morning when he returned to the country from Kuwait on charges of attempted murder of police officer in 2003. Police Spokesman SP Ruwan Gunasekara said the 45-year-old suspect had arrived in the country using a forged passport. He said the police wanted to arrest the suspect in connection with an attempted murder of police officer at Galkiriyagama in 2003 and stealing a T56 weapon from the police. The suspect tried to hit and run over a police officer who was on duty at Balaluwewa at that time. The Anuradhapura Magistrate issued open arrest warrant against the suspect who was a resident of Galewela. Investigation revealed that the suspect who was serving in the Air Force for three years had been AWOL since 2001.